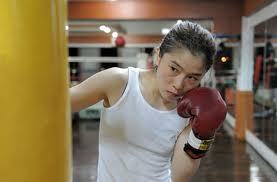 Upcoming Women’s Boxing in South Korea! South Korean boxing champion Ju Hee Kim (15-1-1, 6,KO’s) dominated Fahpratan Looksaikongdon (7-3, 0-KO’s) in their WIBC Light Flyweight title fight. This gives Kim her fifth title! As noted, in an article in the Korea Herald, Kim said “I am so happy to have achieved my goal of becoming champion of the five world organizations.” Click here for link. ->>>Tonight (July 9th) in Ansung, South Korea the IFBA Mini Flyweight championship bout will pit title holder Dan-Bi Kim (7-2, 0-KO’s) of South Korea against Liu Jian (5-0, 0-KO’s) of China for ten rounds of exciting boxing. America’s own “boss” Terri Moss is covering the bouts that will include a ten-rounder pitting WIBA, WIBF, GBU & WBF light flyweight title holder Ju Hee Kim (14-1-1, 6-KO’s) against Thailand’s own Fahpratan Looksaikongdon (7-2, 0-KO’s) (See below for video of Ju Hee Kim). ->>>A second IFBA championship bout will be held on July 16th in Jaechum, South Korea. In this bout the IFBA Strawweight championship will pit title holder and South Korea’s own Ji-Hyun Park (13-5, 0-KO’s) seeking her seventh straight win against another Chinese contender, Sun Qun Yan (5-2, 0-KO’s). On a side note, former IFBA title holder Kim Messer will be serving as a fight supervisor for the IFBA organization — a home-coming of sorts as Messer was born in Jaechun, residing in an orphanage there until being adopted by an American family and coming to the United States. For a preview of Ju Hee Kim, here is video of last year’s ten-round slug fest against Jujeath Nagawa (9-10-1, 5-KO’s) of the Philippines.